This is one of my most favorite books from when I was young. It’s one of those stories I go back to and re-read from time to time, just because it’s such a good story. It is kind of the original YA dystopian story, in my mind, anyway, though it was geared for a younger audience than the ones that stories like The Hunger Games and Divergent are geared towards nowadays. 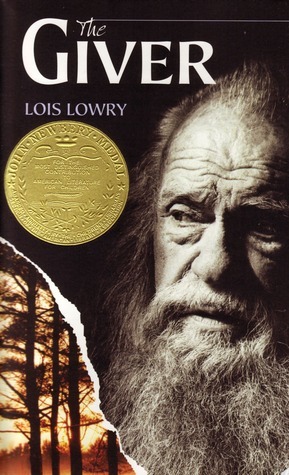 Try to remember, as I write this review, that this book came a long time before either of these two popular series – as it is apparent that both authors must have read The Giver at some point and taken ideas from its pages for their own worlds. Through his training, Jonas begins to learn of a different way to live. He sees a world that has seasons, changes in weather, pain, unpredictability, suffering, war, death, poverty, famine… and he begins to understand why his world has chosen to live without those things. But he also sees something else that has been given up along with these things: love. And he starts to believe that perhaps having love would make all those other things worth bearing. As I said, this is one of my most favorite stories. It brims with discussion topics, which makes my teacher’s heart happy. But more than that, it is a well-written dive into what a world without love would truly look like. It is a story that should make us take a good, hard look at our world and our culture, because there are some disturbing parallels to be found. In the story, of course, the pendulum is allowed to swing to the worst possible extreme. Of course we can’t control the weather, and the government doesn’t assign us our spouses and children. But these extremes are there simply to highlight a world without love. A world that sees euthanasia and abortion as so matter-of-fact and acceptable that not a single person in the community even questions their existence. In fact, they are completely incapable of even seeing the truth of what is happening. Everyone lives their lives asleep to the insidious darkness of their existence. Even the Giver, for all his understanding of the atrocities being committed, has given up on things ever changing. He is awake, but in despair. If you haven’t read this one, you definitely should. I have tried very hard to give a description and hint at a few things without delving through terrible plot spoilers… it’s a very hard book to talk about without giving plot spoilers. As a disclaimer, there are a few scenes that are very troubling. Though the book is designed to be read by 8-11 year olds, parents may want to read this one first and decide if they think their young children can handle the more disturbing elements of this book and the questions they raise. Despite that, I believe this one is definitely worthy of 5 Dragon Eggs. How about you? Have you read The Giver? What did you think of it? How about the movie, have you seen it? What were your thoughts on it? What is one of your favorite books from when you were in grade-school/junior high? Let me know in the comments, I love hearing from you, dear Reader! Great to see you getting more reviews up on a regular basis (personally, I have a soft spot for seeing those dragon eggs gracing your lovely site). This sounds like it’s right up my alley. I tried to explore some of these ideas in my own series, but here it looks like the entire focus is centered on the emotional, cultural, and spiritual dimensions of what it would be like to live in such a “brave new world”. I will definitely have to put this on my (very long) TBR list! I love having the snazzy dragon egg graphics! Thanks again for that gift! Definitely recommend this one, and as an added bonus it’s a nice short fast read. Hmm, I’ve never read The Giver, but now I think I will put it on the to-read list! It sounds intriguing. The idea of having your profession chosen for you is interesting… in Holland, while your profession isn’t actually chosen for you, you do have to pick a career path at an early age. For example, if, at twelve, you wanted to be a doctor, you’d be put into a program heavy in the sciences. It makes changing career paths in high school and college very difficult. Very interesting, I did not know that!